Temi is a Chemical engineer (Curtin University) with a major in Oil & Gas Engineering (UWA). Prior to joining the Training Centre, she worked for four years as a Safety & Risk Consultant in Lloyd’s Register where she carried out various risk assessments, developed safety cases and conducted consequence modelling for various projects across the Oil & Gas, Mining and Chemical industry. 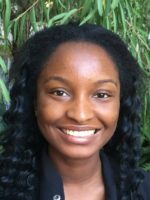 Now as a Ph.D student in the Flow Assurance subgroup, Temi is currently working on Hydrate Management in Liquid Systems with a focus on Under-Inhibition of MEG.